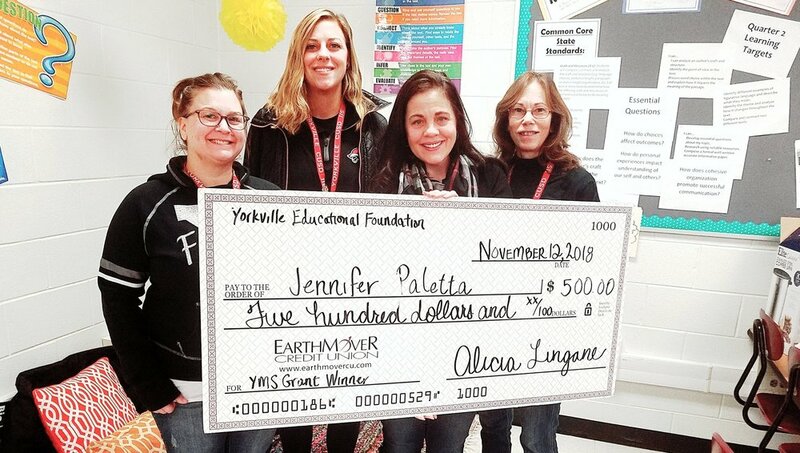 Yorkville Educational Foundation (YEF) celebrates American Education Week by awarding $2,800 in grants to District 115 schools. Eight grants were presented to schools throughout the district, and were selected from applications submitted by district teachers and staff members. 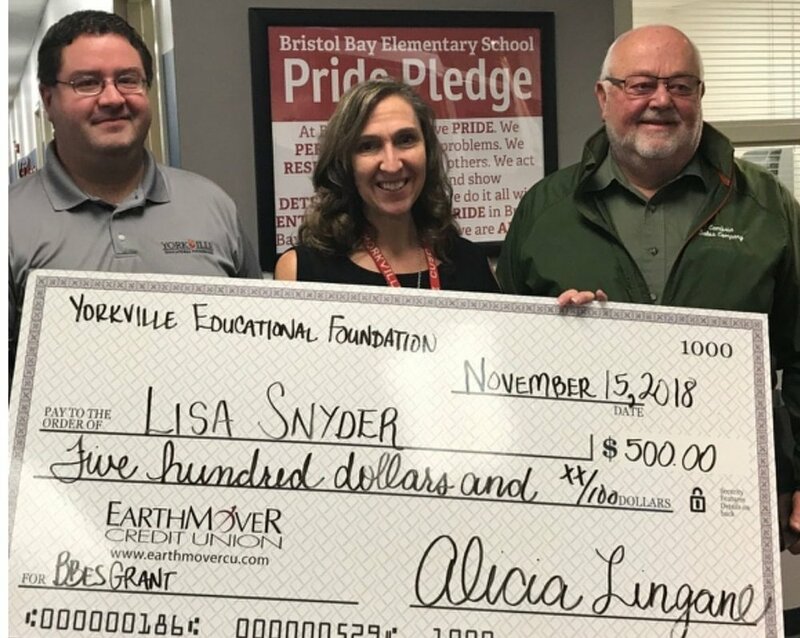 Since 2017, the Foundation has invested more than $15,000 in District 115’s students and staff. Jenni and her team of five staff members want to create a café where staff members can buy coffee and treats. Each sale has a big benefit for our students with Individual Education Plans who run the cafe. They get practical experience with subjects like math and art, as well as experience with job skills and social interactions outside a traditional classroom environment. The team has created activities that tie into their current curriculum. Students will design a FOXES CAFE rewards card, tally orders, collect and manage money, prepare and deliver orders with assistance of the teachers group. These are skills that will serve them as they transition into adulthood as they learn how to become independent, resilient and successful. The $500 awarded to Jenni will go toward start up costs including coffee pots, aprons, cups and other supplies. As a result of this grant, students in the ISP, STARS, SPL, and LASP programs will experience real-life situations that incorporate their IEP goals. Skills such as social interaction, eye contact, interpreting data, will be practiced daily as these students help build a strong YMS community. ELL Specialist Karen Schmidt reports that her ELL students love to talk in a small group, but sometimes are not confident speaking in their large classroom groups, for fear of making grammar mistakes. Karen applied for a grant because she wanted to encourage these students to practice speaking, listening, reading and writing. 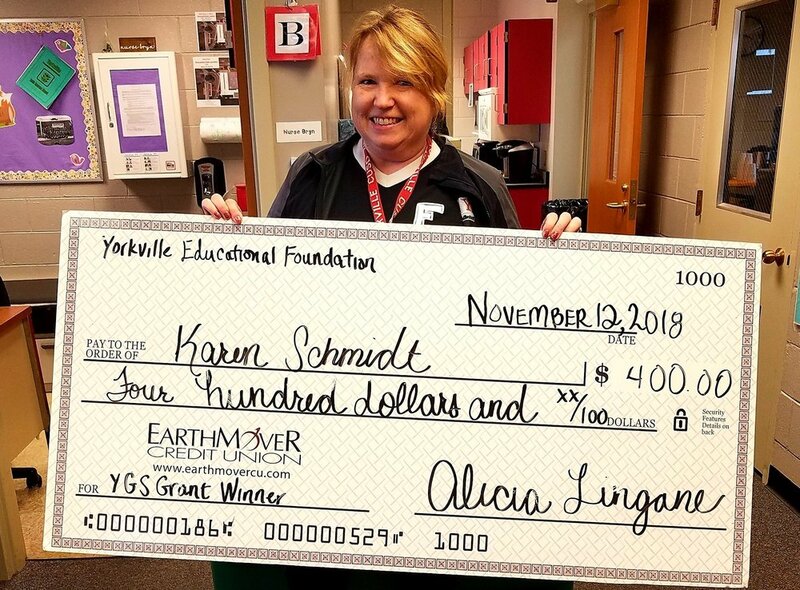 Her grant will cover the purchase of a touchscreen Chromebook, and headphones with a microphone so that her students can practice their speaking. Earlier this year, Karen started a Padlet program where her ELL students record verbal/video responses to prompts and for responding with written feedback to the videos of others. With her new Chromebook, she will be able to pose a prompt to her students each week. Prompts will vary with such skills as comparing and contrasting, retelling, explaining/elaborating their personal experiences and making predictions.She will be able to listen to the responses and make mini-lessons to help them improve. While nothing beats that personal interaction, modeling and facial feedback for developing language that students get in small group, the reality is that technology is how the students are now assessed. The annual ACCESS test speaking portion is done by listening and then recording their response into a computer. She reports that even her most eloquent students score low on this part, because they do not elaborate enough or get nervous and do not have a live person encouraging and interacting with them.. These practice Padlet video prompts and responses are a way to combine the personal touch with the technology. YHS Principal David Travis knows that the better students perform on an SAT assessment, the more post-secondary opportunities they have. That’s why Yorkville High School developed their very own SAT preparation program. The program provides 21 hours of instruction to practice and prep experiences prior to sitting for the SAT exam in April. The YEF grant provides partial or full scholarships for those families who do not have disposable funds to support their student’s pursuit of this program. The program has historically increased students SAT scores for all students who participate, but for economically disadvantaged and first generation students, it provides education equity. A good SAT performance can broaden choices, increase opportunities for financial support, and decrease students entering into remedial coursework in the post-secondary level. Alexis Schilling, 3rd grade teacher at Grande Reserve Elementary, knows that offering student choice is one of the most important ways to boost student learning. That’s why she asked for a grant that will provide her flexible seating choices for her students. Flexible classrooms produce higher academic outcomes while including comfort, community and collaboration. She anticipates seeing students empowered through choice and movement, and studies show that that this empowerment elevates student engagement. Congratulations Alexis! We can't wait to see your improved classroom environment. Reading specialist Lisa Snyder has a passion for literacy. Her grant application told us about her students, most of them low income, who don't have a reading library at home. Her wish is simple: to provide them with one book each quarter that they can take home with them. Her $500 grant will provide her with enough funding to provide one free book to all 86 of her students for this quarter. Lisa’s classroom is filled with reading strategies for her students, including bookmarks that help them with tricky words and reading comprehension reminders. Lisa even created a logo for her room so that her students know where to find her, along with her extensive library of high quality free books. Brittany, a literacy coach at Circle Center Grade School, applied for a grant to create technology recording stations. These are tubs that are lined with foam to cancel out background noise and fun telephones that plug into tablets and Chromebooks that are used to speak and listen into. Brittany will push into classrooms to model and provide mini lessons for how to use student portfolio apps such as Seesaw and Class Dojo to record student literacy work with these recording stations.She envisions CCGS students recording themselves reading a book for reading fluency practice or they can record themselves reading a finished writing piece. These stations are engaging and get students excited to share their work with their teacher and the portfolios can also be sent home for parent access. After teachers receive professional development on how to utilize the recording stations they will be able to check these recording stations out from our school library to use. She can’t wait to incorporate these recordings to make student literacy portfolios more effective, motivating, and engaging for students, staff and parents. Learning Behavior Specialist Abby Paulson loves using the Seesaw app with her students. It is a student driven portfolio that can stay with students over many years to quantify and measure growth in nearly every subject. When it came to applying for a grant, Abby wanted to take it to the next level with a Seesaw Plus license. Seesaw Plus allows her to record her formative assessments in a straightforward manner. It allows her to easily differentiate instruction, build on student strengths, encourage creativity, and use critical thinking skills. Seesaw Plus allows kids to save and submit a variety of work through the app: videos, photos, text, and drawings. Students can reflect on their work in writing or with a voice recording when they submit it, and as a teacher, Abby, can offer feedback as well. Abby reports that she can approve items to make them accessible to parents. This is an important way to open dialogue and enhance communication with parents. Congratulations Aby!